Cincinnati Comic Expo 2016 Photos, Part 2 of 2: Who We Met and What We Did « Midlife Crisis Crossover! 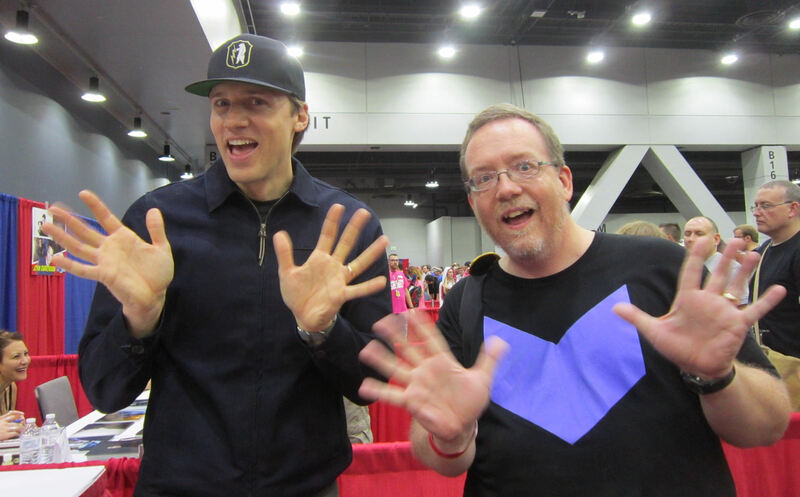 Jay Garrick and I prepare to travel to another, better Earth if only we can achieve the proper vibrational frequency through jazz hands! It’s convention time yet again! This weekend my wife Anne and I have driven two hours southeast of Indianapolis to attend a show we’ve never done before, the seventh annual Cincinnati Comic Expo. In the past she and I have talked about trying cons in other Midwest cities, but the Expo is our first time venturing out to Ohio for one. In addition to proximity and complete lack of schedule conflict with anything else we had going on, CCE’s guest list includes a pair of actors we missed at previous cons who represented glaring holes in one of her themed autograph collections. With her birthday coming up in a few weeks, which usually means a one-day road trip somewhere, we agreed this would count as her early celebration. Part One was our complete collection of cosplay photos. I regret we didn’t meet enough imaginative fans to fill five more galleries, but the truth is we accomplished so many of our goals on Friday that by 12:30 Saturday we’d checked off all the major items on our con to-do list and saw no point in trying to prolong the magic. Despite the reduced number of hours on the premises, we had a ball and would highly recommend the event to other fans. Pictured above: Teddy Sears, a.k.a. Jay Garrick from The CW’s The Flash, my favorite show on the air, preparing to start its third season in October. I loved Sears’ performance as the beloved Flash of an alternate Earth who shows a shocking amount of weakness through the middle of the season, only to reveal a darker side toward the end that would be spoilers if you’re waiting for it to hit Netflix. He’ll next be seen in Fox’s upcoming 24: Legacy but would love to return to DC’s TV universe if time and story permitted. Very friendly guy who let me rattle on more than most actors normally do. He was our main reason for sticking around Saturday, and was a little late like several other actors, but it was interesting to see who the early birds were on the guest list. Today's #CCE16 winners for early-bird autograph punctuality: Peter Mayhew, Lee Meriwether, Mike Quinn, Tim Rose. Come say hi now, folks! Officially we weren’t at Cincy Comic Expo for me alone. Anne wanted to meet two people in particular, Star Wars actors that we could’ve met years ago if circumstances hadn’t worked against us. 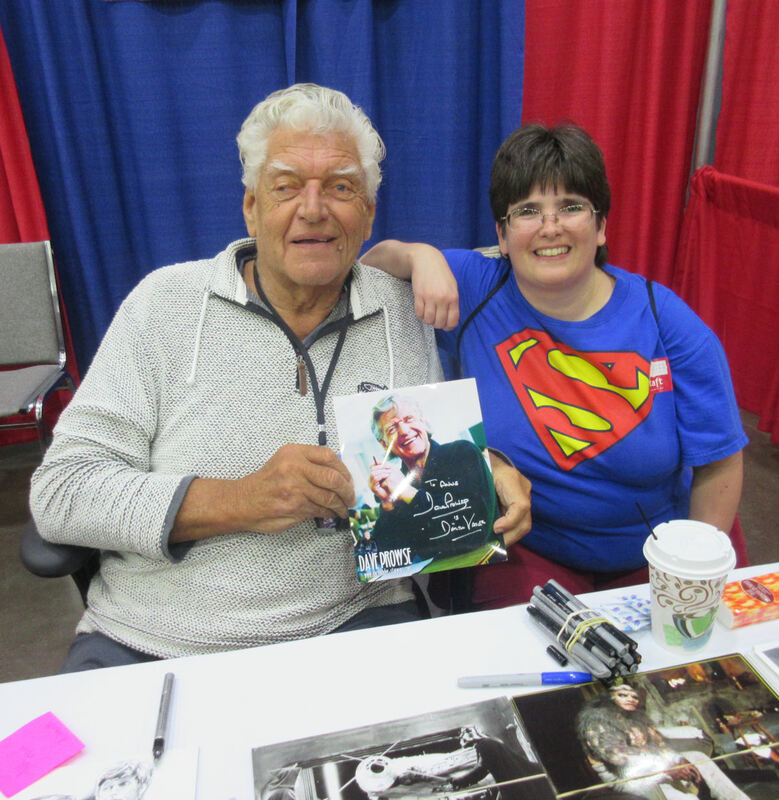 Gentleman #1: David Prowse, a.k.a. the man inside the Darth Vader suit for the original trilogy. He was a guest at Wizard World Chicago 1999, our first large-scale convention and our very first road trip together, but we were too overwhelmed by scope and too poor at the time to meet any of that show’s big Hollywood names. Fun trivia: Prowse was a bodybuilder and trainer who helped Christopher Reeve get into shape for Superman: The Movie. Prowse pushed him so hard on day 1 that Reeve threw up later. Possibly the most sinister act Lord Vader ever committed was making Superman vomit. Very special Star Wars guest #2: the one and only Billy Dee Williams, a.k.a. Lando Calrissian. 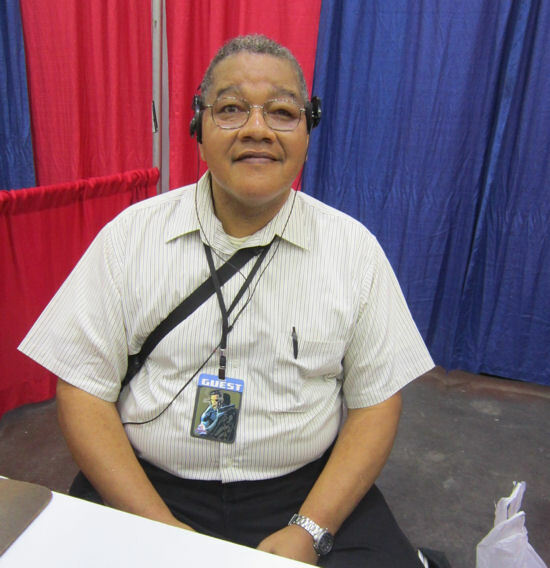 He was previously a guest at 2002’s Star Wars Celebration II in Indianapolis, but by the time we’d escaped the 2½-hour line for Kenny Baker, we had autograph tickets to spare but just couldn’t bear the thought of another hours-long major-league wait. Here in 2016, we’ve now compensated for our underdeveloped stamina of fourteen years ago. The suave, esteemed Mr. Williams made us feel crassly underdressed for the occasion. 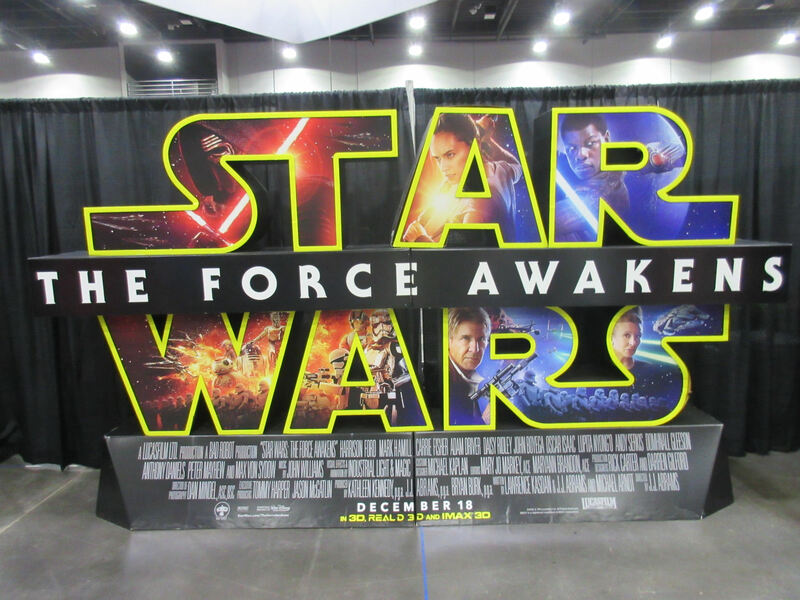 Although Star Wars was a focal point for CCE this year, some guests had credits in other, differently legendary universes. 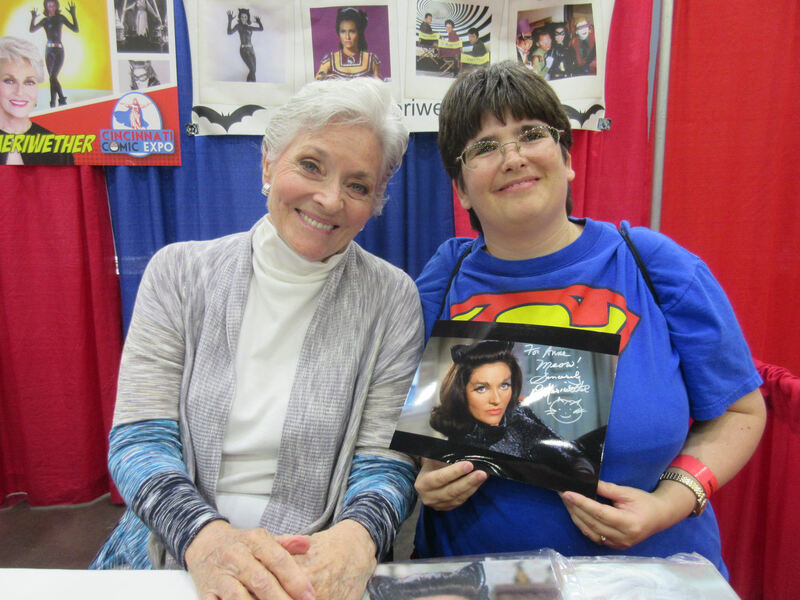 Very few veterans of the world of Batman ’66 are still with us today, but one was in the house: Lee Meriwether — best known to us Gen-Xers as costar of Barnaby Jones reruns and one-time Catwoman in the Adam West/Burt Ward Batman movie. Extraordinarily sweet and gracious, and had her daughter along as her table manager, which we could tell even before someone asked. 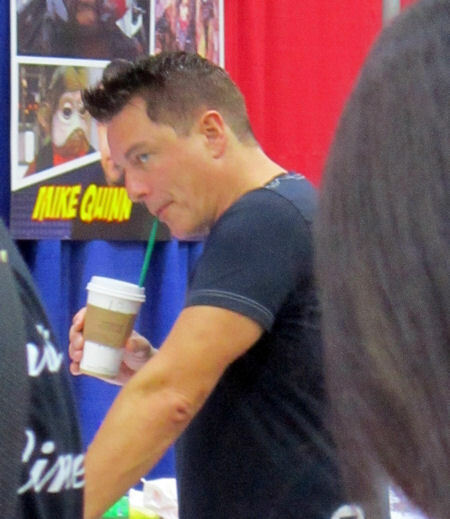 MCC readers may remember the great John Barrowman from our Wizard World Chicago 2016 experience. Here he prepares to meet fans face-to-face for hours and hours with nary a fluctuation in energy levels. 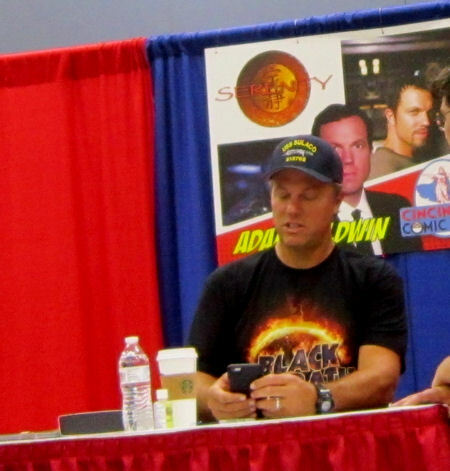 I added Adam Baldwin’s signature to my Firefly collection at Wizard World Chicago 2015. Naturally the con had more than just actors on the scene. Their Guest of Honor was the Stan Lee. Cincinnati thought so highly of him that Mayor John Cranley issued an official proclamation that Friday, September 23, 2016, would hereby be Stan Lee Day. I got the chance to meet him at Wizard World Chicago 2012 and would recommend the fleeting brush-with-greatness to anyone who hasn’t met him yet. Be warned: at age 93 Stan is winding down his convention circuit days and probably won’t be doing these shows much longer. He’s scheduled to return next spring for C2E2 2017, which their site currently touts as his final C2E2 appearance ever. Beyond that…I wouldn’t recommend procrastinating if you can help it. I did make a point of saying hi to two longtime comics creators. 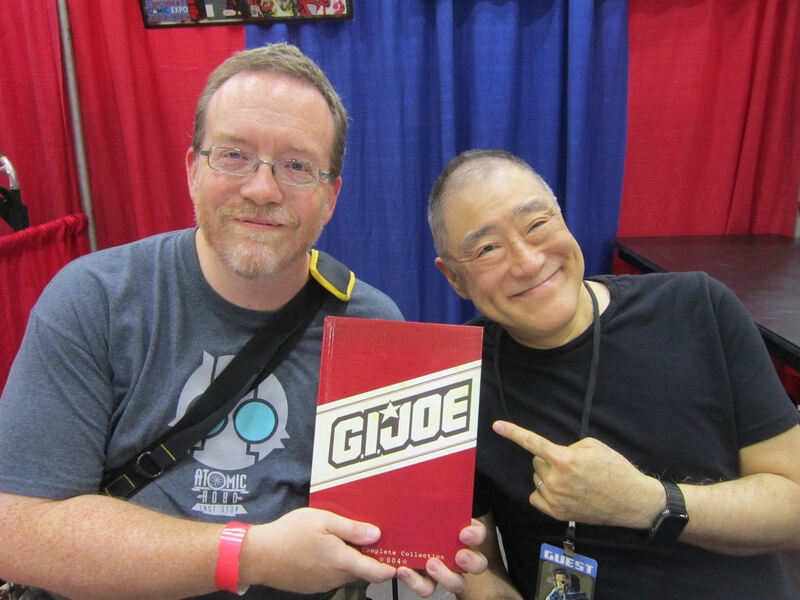 First up: classic Marvel editor Larry Hama, who was a staffer for decades, renowned for his 13-year run as writer on their GI Joe series, and an early advocate for encouraging more than just white guys to join the field. Currently he’s doing layouts for DC’s Deathstroke the Terminator, written by his former editorial protegé Christopher Priest. It was supposed to be a one-issue gig, but they keep needing him and as of this weekend he was working on issue #4. So far it’s my favorite DC Rebirth title. Also in the house: artist Mark Bright, whose extensive resumé includes Power Man & Iron Fist, Iron Man (including Obadiah Stane’s final arc), Green Lantern, and a vastly underrated Falcon miniseries from back in the day. With the aforementioned Christopher Priest he co-created Quantum & Woody, one of my favorite ’90s titles; with the late Dwayne McDuffie, he launched Icon, my favorite Milestone Media title that really needs to be reprinted in full someday soon. In his time, Bright has drawn a lot of comics that rose to the tops of my reading piles. He was a little late to his Saturday signing because he wanted to stop and say hi to Larry Hama first. 100% understandable. 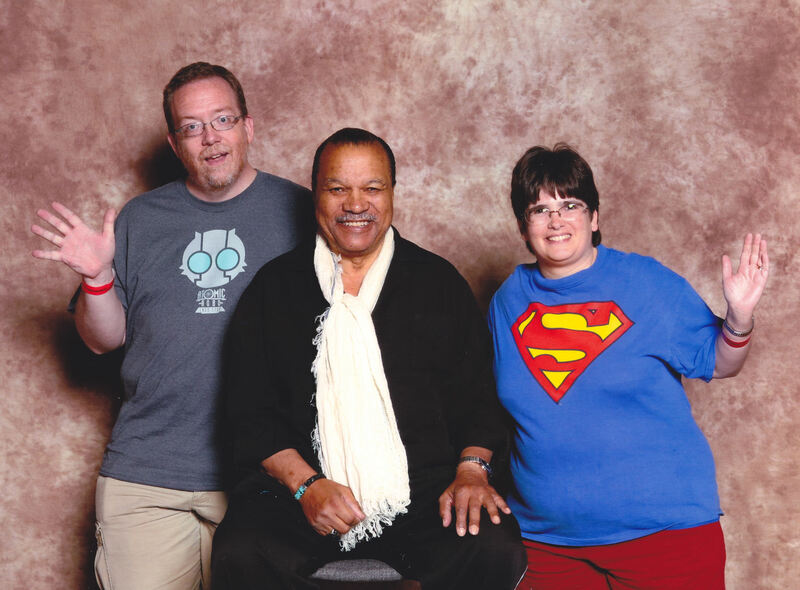 He was super excited to meet Billy Dee this weekend, too. Other creators had lines of varying lengths, a couple of whom I regret missing. Arguably the biggest name in the house was controversial ’90s superstar Rob Liefeld — co-conspirator on Cable, Deadpool, and the original X-Force; founding member of Image Comics; and one-time star of a jeans commercial. He was the only artist with a booth over in the actors’ section. 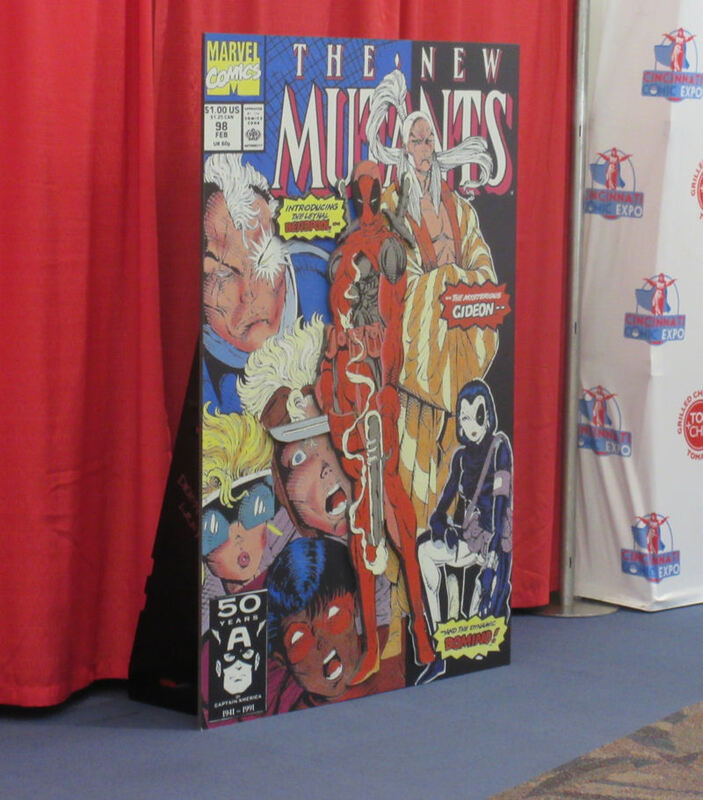 Superfans had the privilege of paying $150.00 for the Rob Liefeld Experience VIP admission package, which included lots of swag all covered in Rob Liefeld art, looking a bit like this enlarged New Mutants cover. We were, shall we say, not there for the Rob Liefeld Experience. I bought a few items for fun, but the important part was Anne enjoying the heck out of her early birthday shindig. And much enjoyment was had with the variety of displays and props provided courtesy of the 501st Legion and other local fan groups with fantastic ideas for taking the convention experience to a wilder level. 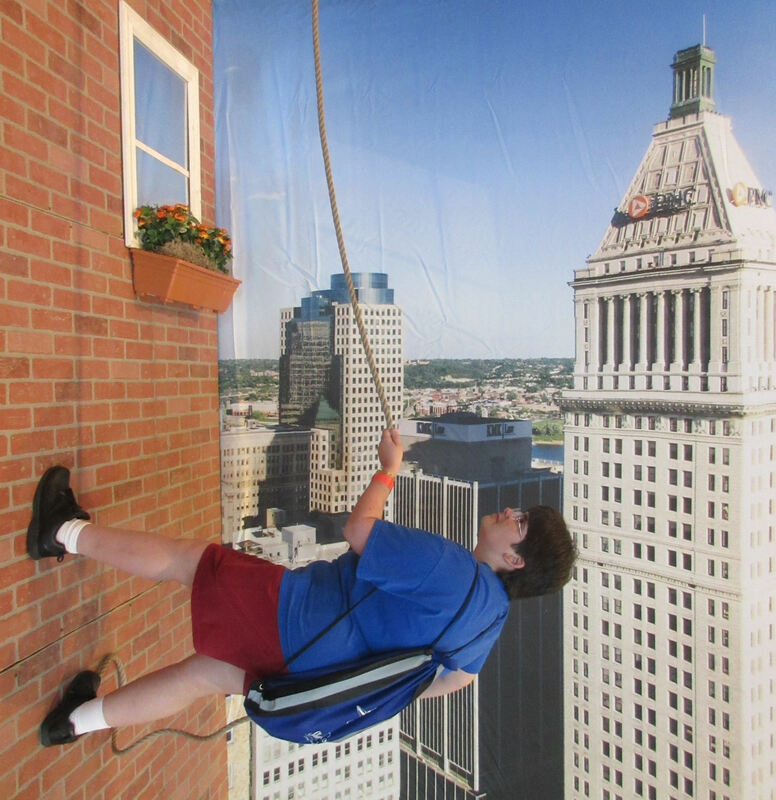 Anne climbing the nearest skyscraper Batman ’66 style, hoping the next celebrity to peek their head out the next window will be either Charo or Kate Mulgrew. Anne tries to save herself by summoning her lightsaber hilt before the Wampa can shamble over and Jedisplain to her how telekinesis actually works. Preorder your Action Anne figure today! Accessories include a Bible, a replica of our dog Lucky, a stack of 8×10 hard plastic photo protectors, and a giant cookie. 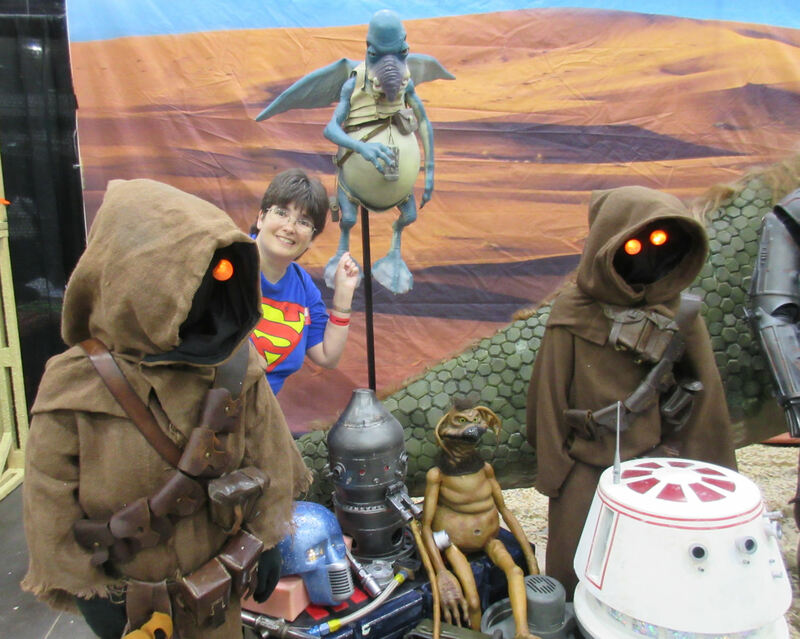 Watto and the Jawas organize a swap meet, and Anne was there! Bargains found: zero. Not everything was about her. Midday Friday, we experienced a bit of awkwardness when we tried to grab a seat at a table near the concession stands and rest for a few minutes, only to find we’d accidentally wandered into the Steve Jackson Games playtesting area. We own more than our share of board games but aren’t regular tabletop aficionados. Before I could sit down all the way, a very nice volunteer scrambled over and began to ask us which game we wanted to try. 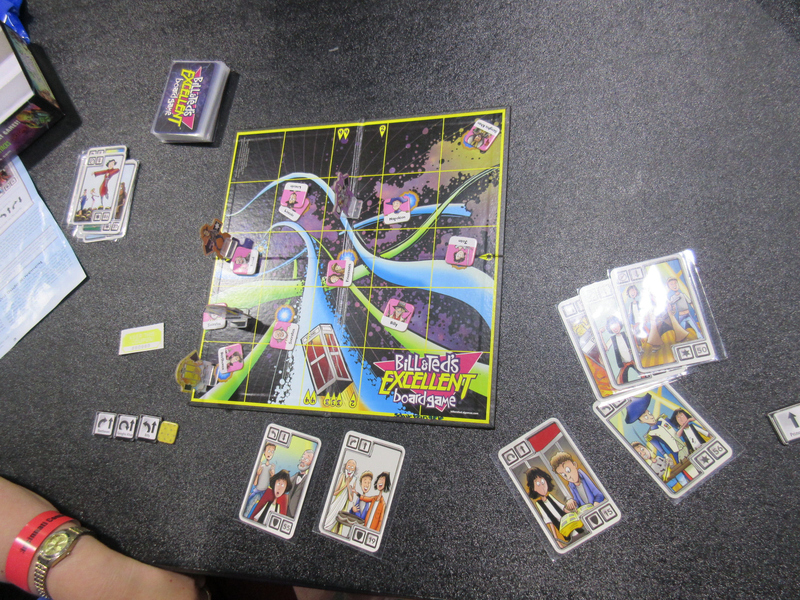 Rather than risk standing up some more, I grabbed the first game I saw standing nearby, and that’s how we wound up spending twenty minutes on a demo of Bill & Ted’s Excellent Board Game. All things considered, I wouldn’t call it non-non-heinous. The object: drive your time machine around the board and be the first to collect all the famous historical figures from the first movie, using the most bizarre movement methodology I’ve seen in a board game in years. I took to it more quickly than she did, so I tried not to nitpick when she moved incorrectly at least three times. The volunteer caught on and joined me in polite silence on that subject until our time was up and we had to go keep an appointment. As a thank-you for stopping by, the volunteer showered us with freebies — two Munchkin bookmarks, two free cards for two different Munchkin games that I have no use for, and a complete dice game called Trophy Buck that comes in a camouflaged pouch that would fit well on many Rob Liefeld costumes. 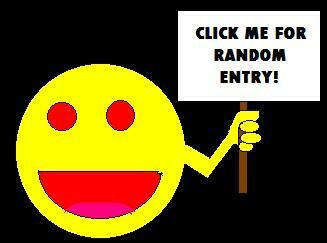 She also gave us tickets for a prize drawing scheduled at 6 p.m. 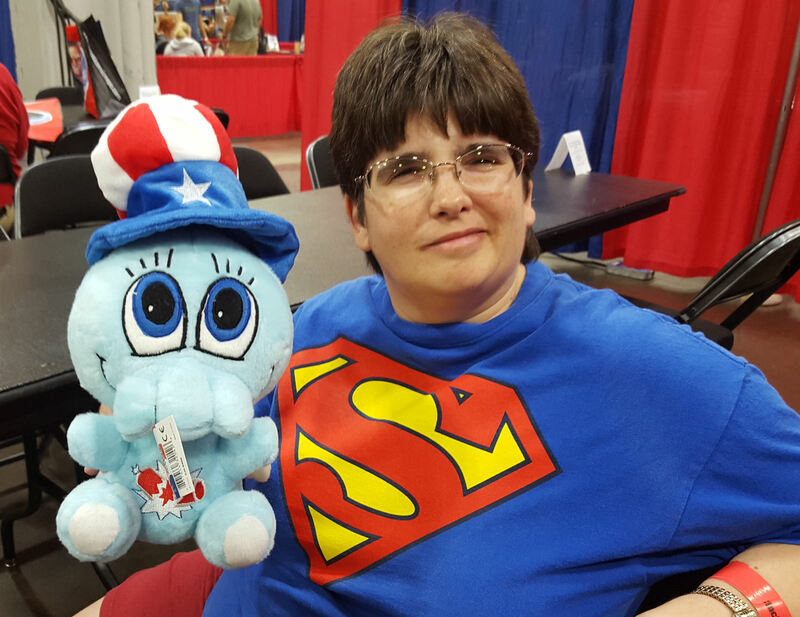 I came away empty-handed, but milady won herself a stuffed, Fourth of July themed, Chibi-headed Cthulhu. Not really her thing. At all. I like to think someday Chibithulhu will be bigger than Beanie Babies. Collectors strongly encouraged to send me your four-figure auction bids for this soon-to-be-classic collectors’ item right away. If no one bids, we feed it to the dog, as is the custom for unwanted stuffed animal prizes in our household. 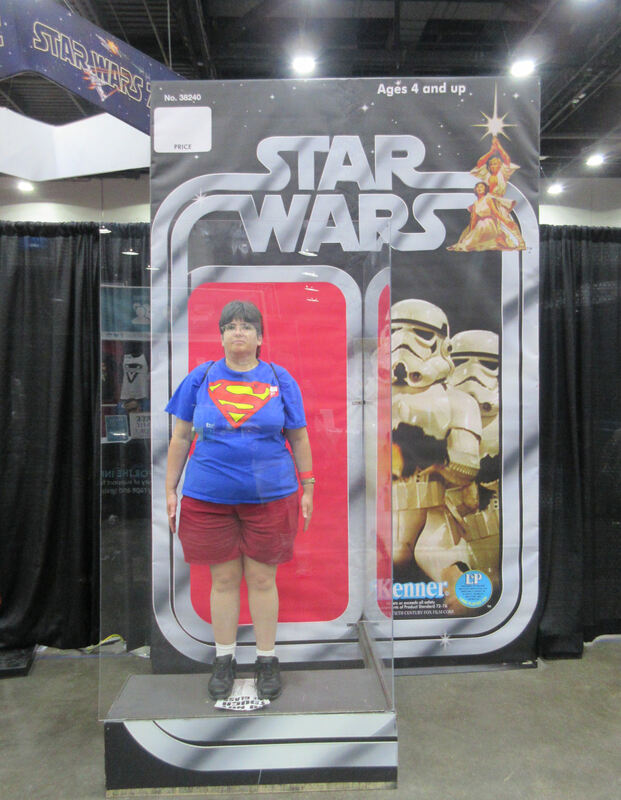 To be sure, Cincy had other nifty random objects of fandom here and there around the show floor, many of them with Anne on the other side of the camera rather than playing MCC Lovely Assistant. Probably retrieved from a local theater after several months of continuous use. 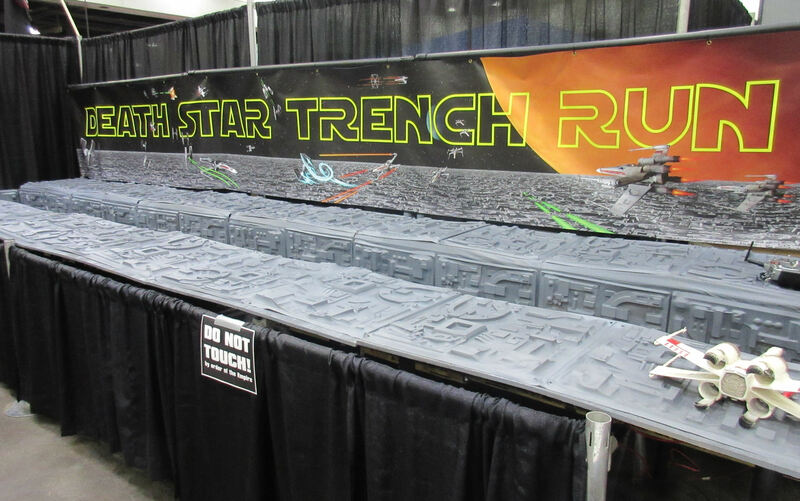 The Death Star Trench Run was a scale model of that classic scene in which the whiny dust-bowl bumpkin uses spirit-telekinesis to win a space carnival game with space torpedoes. At last, fans could have a turn replicating this feat. 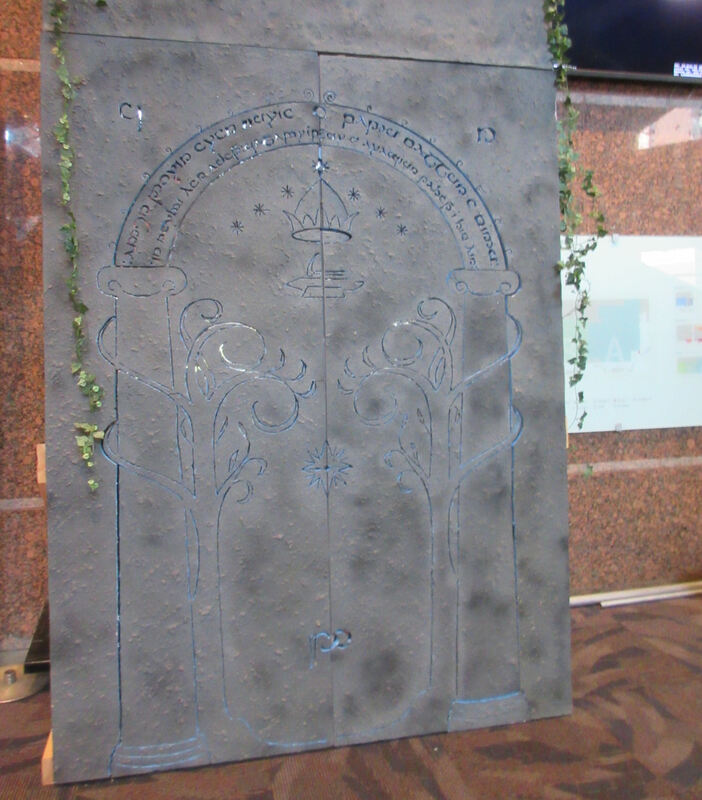 The doors to the Mines of Moria. I think the Elvish runes above the door read “SPEAK LOTR FAN BUT DO NOT LEAN ON PROP”. 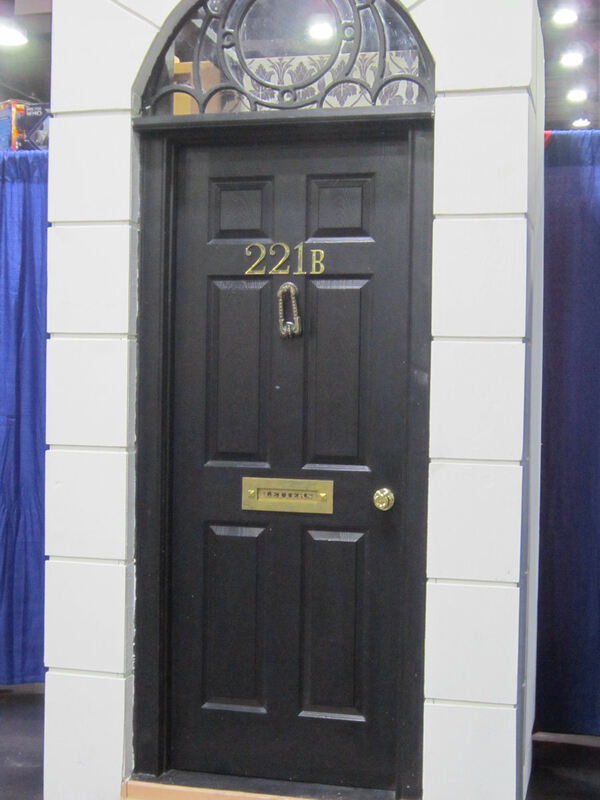 The famed door to the abode of Sherlock Holmes. The “B” probably stands for “Benny”. 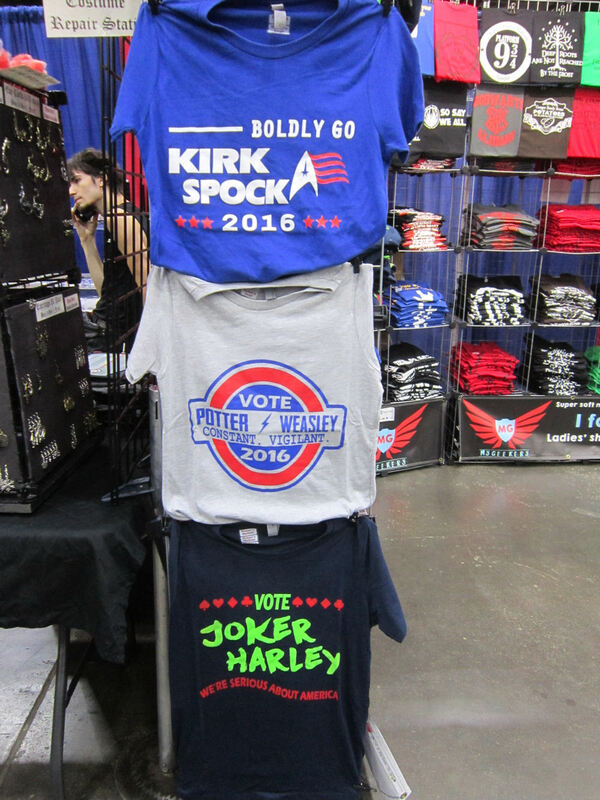 With the American Presidential election six weeks away, the T-shirt makers at My Geekery have far better suggestions than literally anyone who threw their hat in the ring for real this year. 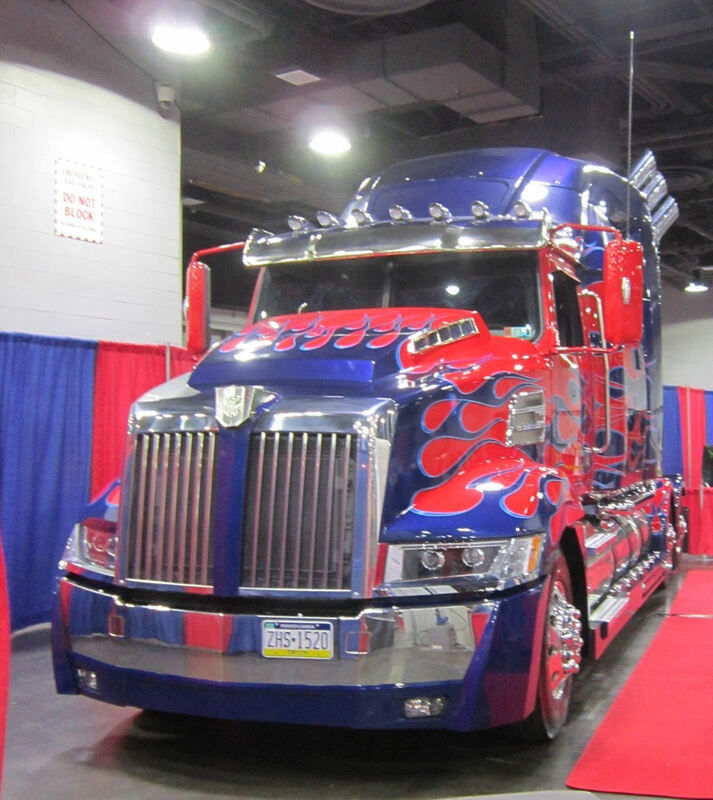 For $20 you could sit in this familiar-looking semi and pretend you’re Shia LaBeouf. You have fun with that. Another high point of Cincy: this was the first convention we’ve ever attended at which I genuinely got excited about the food choices. For C2E2, Chicago’s McCormick Place makes a mean barbecue sandwich, but the Duke Energy Convention Center has them beat. Local restaurant Tom & Chee sponsors the con’s kid zone, has a catering truck on display, and has a booth selling a selection of their offbeat grilled cheese sandwiches. We have a Tom & Chee twenty minutes from our house, but I had no idea they brought scrumptious victuals with them. With Tom & Chee, Skyline Chili, and LaRosa's Pizza in the house, for food alone #CCE16 is the greatest convention in American history. 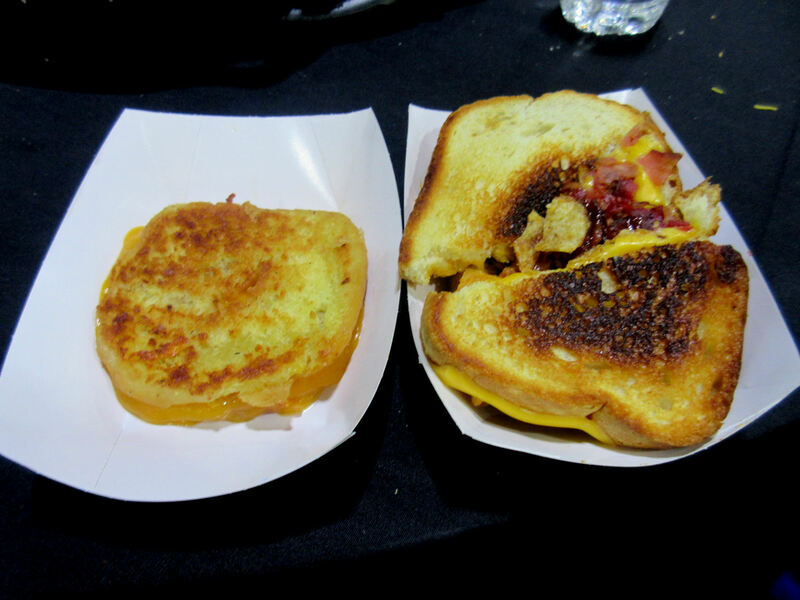 My solid-A Friday dinner: their Grilled Cheese Donut (simple as it sounds, but TO DIE FOR), and the BBQ & Bacon topped with cheese, crumbled bacon, and BBQ potato chips. We stayed over Friday night at the Hyatt across the street, one of the nicest we’ve ever seen. We got a nice discount thanks to the points I’ve saved up from our Wizard World Chicago stays as well as from some of our annual road trips. Insider tip: if you drive into town, you can pay $30 for the Hyatt’s valet parking, or park for 24 hours for $15 in the third-party garage across the street. The entrance is down on 4th Street, just west of Elm. 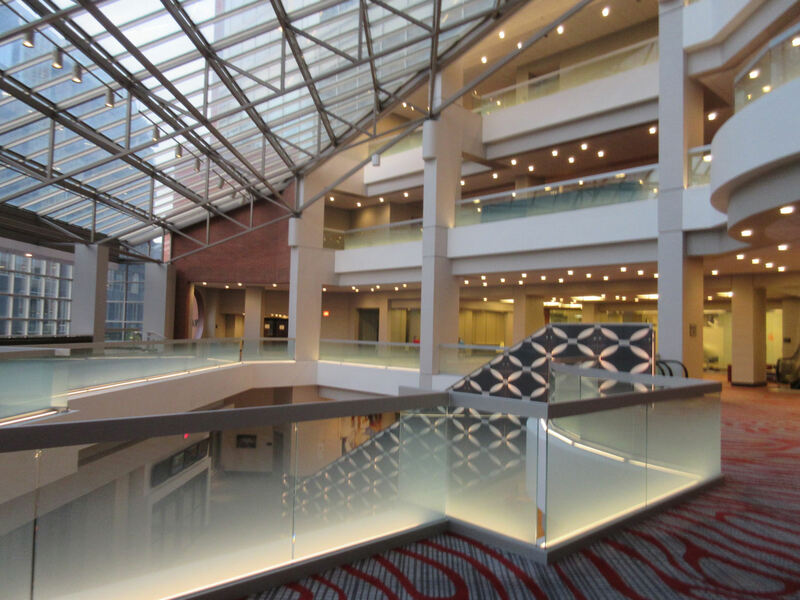 This is the view of the Hyatt lobby when you exit the garage skywalk. Anne and I rarely stay at the hotels nearest to our conventions, partly to save money and partly to avoid loud parties. This show reminded us of one of the fun perks of said hotels: accidental brushes with greatness. When we left the con Friday to go check in, David Prowse was in the lobby on his motor scooter, chatting with fans. 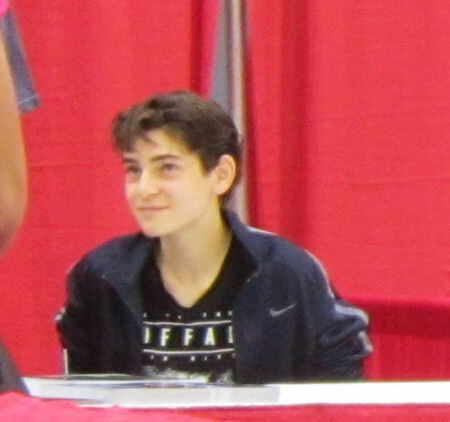 After we boarded the elevator to head up to our room, we were joined by David Mazouz with his head down, plus a motherly figure of some sort. Anne recognized and nodded at him, but otherwise kept it low-key. We don’t like to bother the actors when they’re “off the clock”, so to speak. They need breathing space just as much as we do. 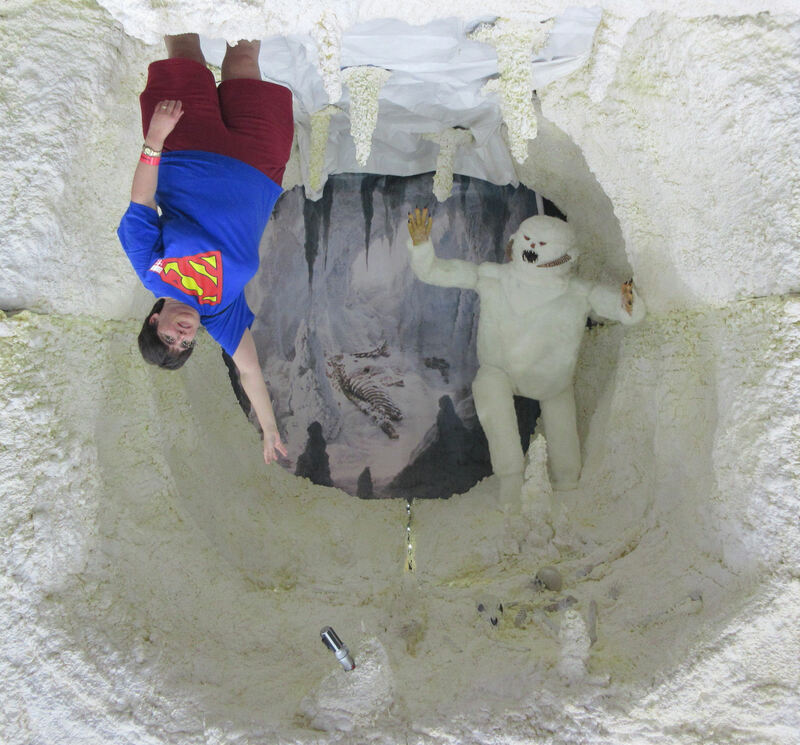 Then there was the incident in which I came thiiiis close to ruining the convention for thousands of fans. Early Saturday morning, we packed our bags and prepared to check out before returning to the con. I’m carrying a laptop bag, my conventioning carryall, and a large gym bag filled with all our laundry and the books I’d bought on Friday, including that weighty hardcover you see in the Larry Hama photo. It was heavy and kind of killing me. I expected my chronic back pain to kick in any second. We and another older, non-geek couple wait patiently for an elevator to meet us at the ninth floor. The door opens. Four or five people are already inside, lined around the walls but leaving a good gap in the middle. Anne’s in front of us four. Her eyes widen and she hesitates. A fairly muscled gentleman invites us aboard. She goes in first and I follow. I do an about-face toward the door and begin to step backward and to my right to make room for the other couple to join us. I know there’s someone scrunching into the corner behind me, so I’m trying not to back up too quickly. Anne’s eyes grow to Powerpuff Girls size. She grabs the gym bag strap and yanks me forward. Hard. I presume I’m threatening the life of the corner dweller without realizing it. For a guy my size, I’m constantly trying to stay overly conscious of how much space I’m taking up in crowded areas, but I guessed by her reaction that I was about to miss the mark and injure someone. The friendly muscle-guy says to me, “It’s okay.” I relax a tad, but keep myself locked in the same approved neutral position. Anne’s eyes contract only slightly. The elevator lets us off at the main lobby with no further stops. The couple from our floor exits, then the two of us, then everyone else aboard. I was out of sight-line when we got on, then had my back to the guy in the corner for the whole ride. I confessed I didn’t get a good look at him. Now I have Powerpuff Girl eyes. And a slack jaw, and the sound of the world’s loudest needle-scratch clearing all other thoughts from my stunned brain. I nearly snap my neck whipping around to look. Stan the Man and his friendly handler are walking away in the other direction, toward the hotel restaurant for breakfast before the mythmaker has to clock back in and go meet several thousand more fans over the next two days. …and that’s the story of how my wife saved Stan Lee’s life and mine. If word had gotten out that Stan had to cancel his Saturday and Sunday appearances because some clumsy schmuck put him in the hospital, I doubt those thousands of fans would’ve let me leave town alive. …and on that note of incredulity and relief, we conclude our Cincinnati Comic Expo 2016 experience. Look for future entries to cover what else we did in Cincinnati over that same weekend in a few future entries here on MCC. Special thanks to the Duke Energy Convention Center for trumping both the Indiana Convention Center and Rosemont’s Donald E. Stephens Convention Center in one critical area: they leave the cel signals alone and make free live-tweeting possible for fans like me instead of being greed-heads about it. Sincerely appreciated. On the other hand, I do have one gripe about the Expo: their official Twitter account tried encouraging folks to live-tweet using the hashtag #CCE16. 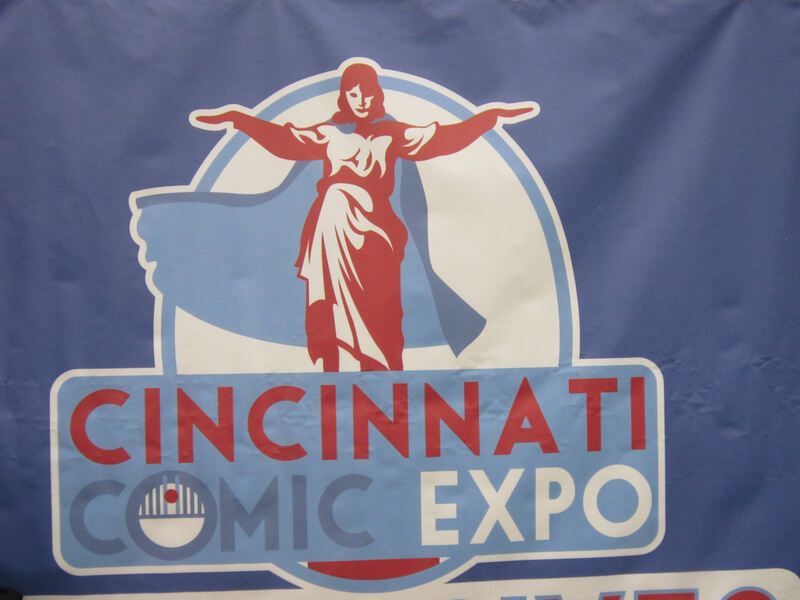 This acronym, which is also in use by another unrelated organization with an event coming up next month, went largely unheeded and outnumbered by folks using the more character-consumptive but fine-tuned #CincinnatiComicExpo instead. As a result, nearly all my #CCE16 hashtagging was a waste of time and I was largely exclaiming into a void occupied by a handful of awesome folks that I’d hug individually if I could. You can read more about my big corporate-hashtagging pet peeve in a previous MCC entry, “Dear Event Promoters: Please Don’t Make Us Pick Your Twitter Hashtag for You“. On that note, thank you for stopping by and reading. We’ll see you next con. Will we attend again? Time will tell. If they can bring in Kate Mulgrew next year, I guarantee Anne will be there bright and early and banging on the doors till they let us in. Trust. « Cincinnati Comic Expo 2016 Photos #1: Cosplay!